There are all kinds of amazing Rain Forest animals. Check out some of these amazing creatures by exploring the National Geographic interactive Rainforest. See if you can find all of the different animals! Climb all over this virtual Rain Forest Tree House to explore some of the animals that live in the Tropical Rain Forest. Just click on Tree House to see what wonders this program has to discover! What amazing plants and animals are hiding deep within the rain forest? Become an explorer and see what you can find browsing through this virtual rain forest. Just click on rainforest explorer to begin your explorations! Animals are everywhere in the tropical Rain Forest. Take a look at some of the needs of these magnificent creatures that make up such a wondrous part of God's creation! How are these animals like some of the animals you see in your backyard? How are they different? Just click on Rainforst Animals to find out! Check out one region of the rain forest found in South America. Fly down to the Amazon and search for some of the animals that reside there. See what other treasures are hidden deep in the Rain Forest of South America. Click here to begin your Journey! 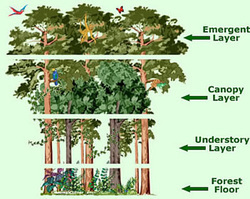 Did you know the Tropical Rainforest is made up of four basic layers? Discover who lives in each of these layers, why the Rainforest is important, and who lives and protects this important biome. Just click on Layers of the Rainforest. Every day animals in the rainforest are being put in danger. Many animals are loosing their habitat, food, and are being hunted or captured for their furs and skins. 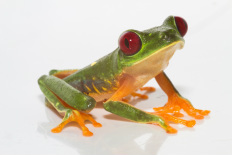 See which animals from the Amazon Rainforests are endangered. Then, check out some other endangered animals from other biomes around the world. 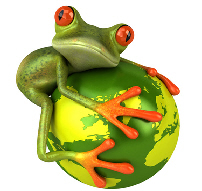 Click on Endangered Animals to check them out and see how you can save the animals of the rainforest! What adaptations are found on the pygmy three-toed sloth? Check out this video about the newly found sloth that is perfectly designed for an island lifestyle.